One of the major new technologies we introduced in SAP Solution Manager 7.2 was the SAP Fiori Launchpad. I will provide a brief introduction here, and, time permitting, I will go into other practical details in further blog articles. You can set up a central launchpad to provide your users a single point of access to applications running on multiple systems. There are extensive configuration, personalization, and customizing options, making it easy to tailor the content delivered by SAP to your own needs and to add your own content. The launchpad adapts automatically to different environments, so users can use mobile devices as well as desktop computers to access it. The launchpad supports multiple UI technologies. Aside from native SAP Fiori apps, you can add SAP Web Dynpro applications, the SAP CRM WebClient UI, and really anything which can be launched by a URL. In fact, the Launchpad provides such extensive and easy to use configuration facilities, that SAP delivers the content (the tiles in the launchpad) more as examples for you to rearrange in completely new constellations as appropriate for your user roles. We actively encourage you to rework the tile catalogs, groups, and related authorization (PFCG) roles as you see fit. You can start the launchpad from the SAP GUI in your Solution Manager system by entering transaction SM_WORKCENTER. What we did in Solution Manager 7.2 was simply redirect this transaction – which in 7.1 used to launch the now deprecated workcenter framework – to the SAP standard transaction /UI2/FLP. We of course do not expect your users to log on to the Solution Manager by SAP GUI only to start SM_WORKCENTER or /UI2/FLP: distribute the resulting URL to your users and have them bookmark it. As a central front-end server (Central Hub Deployment), in a system separate from the Solution Manager. You can get up and running with the Solution Manager without having to prepare any other infrastructure. SAP provides tiles in the Fiori Launchpad for the complete Solution Manager suite of applications, regardless of UI technology: there are tiles for Fiori, Web Dynpro, CRM Web Client, and UI5 applications, as well as external content such as relevant Help Portal and Support Portal Web pages. You will always have a fallback launchpad to access Solution Manager applications. This is particularly relevant if you want to separate your monitoring infrastructure from your production applications, or if you want to use the Solution Manager to accompany the complete application life cycle of your central production launchpad, including planning, upgrades, and maintenance, during which your central launchpad might not be available. This is the option which SAP recommends for the Fiori Launchpad. 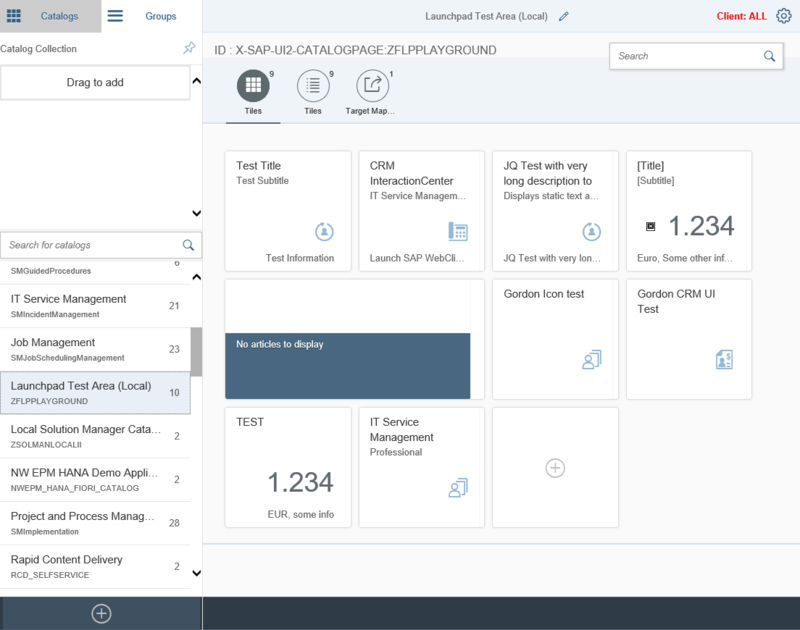 A central launchpad is particularly useful if you are using additional Fiori apps which connect to other back-end systems than the Solution Manager. 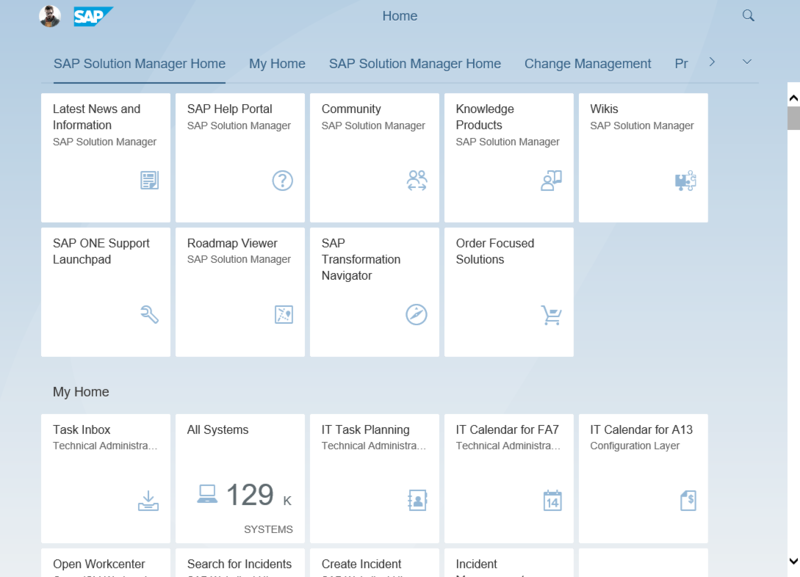 You can run on a different NetWeaver release than that of the Solution Manager (see the product availability matrix for SAP Fiori for SAP Solution Manager – ST-UI). This separates the front-end from the back-end systems by using SAP Gateway OData Services. Currently only the Solution Manager Fiori apps are directly deployable on a front-end server . (these are the apps contained in software component ST-UI). 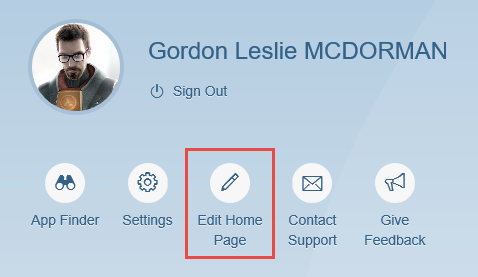 You, however, can add additional content, such as CRM WebClient or non-Fiori UI5 applications, by manually creating tiles which contain URL links to the respective applications on the back-end system. The Fiori launchpad provides three layers which allow you to define and adapt the available content: Configuration, Customizing, and Personalization. Create your own, new, tile catalogs and groups, either by including the tiles delivered by SAP, or by creating your own tiles. You do this in the configuration layer. Customize the tile catalogs and groups delivered by SAP, by removing, adding, or regrouping the tiles. You do this in the customizing layer. Assign the existing or new tile catalogs and groups to your own PFCG roles, in order to determine which users can access which content. Allow users to personalize the tiles they see in the launchpad. They can remove or regroup the existing tiles. Users do this in the personalization layer. This is the layer which SAP uses to deliver the tile catalogs and groups available in the Launchpad. Configuration is client independent – You need a workbench transport request to make changes. 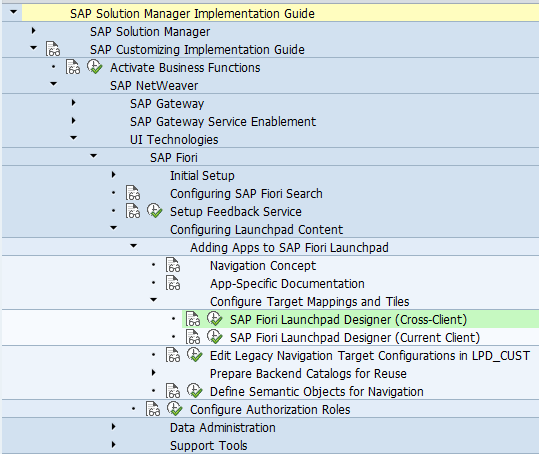 Access configuration mode through transaction /UI2/FLPD_CONF or from the IMG activity “SAP Fiori Launchpad Designer (Cross-Client)”. In this mode you can create your own tile catalogs and groups, create your own tiles, or add the tiles delivered by SAP to your own catalogs and groups. You should not change the content delivered by SAP in this mode. This is the layer which you can use to adjust the client independent content delivered by SAP or configured by you. Customizing is client dependent – You need a customizing transport request to make changes. Access customizing mode through transaction /UI2/FLPD_CUST or from the IMG activity “SAP Fiori Launchpad Designer (Current Client)”. In this mode, you can adjust the content delivered by SAP, but be aware that you may have to reset your customizing if SAP delivers additional or changed tiles in the future. You can also adjust your own content here, if you have created new catalogs or groups and want to make client or system specific adaptations. This is the layer for your users to adjust the launchpad content to their own needs. Personalization is specific to each user: one user’s personalization changes will not affect other users. Users can move tiles around, create new groups of tiles, add tiles from catalogs to their groups, and remove tiles from their groups. They can neither delete tiles from catalogs nor create new tiles. You can restrict users from carrying out some or all of the personalization options. There are authorization and customizing options for this.